Maybe the way he spent part of his childhood helped toughen him up. According to the family, when Joe was nine, he hired out to a sheep man to help with the lambing. When the lambs were born—often in the middle of the night—Joe would put the ewe in a little tent with her lamb to keep the lamb from getting cold. Joe used to spend lonely nights out on the prairie, in chilling rain, with only the sheep for company. He did it willingly, though, to help the family earn money. Once, when Joe was a little older, he and Tommie were out roping and riding wild steers near the butte when all of a sudden Joe got thrown high in the air from one steer. When he came down, he ran at the steer and tried to hit him—even though he had bones poking out through his skin, where they had broken. Not far from Thunder Butte was a coal mine. The locals would go there in the fall and mine coal for the winter. One fall, when Joe was 17 or 18, he was working at the mine. He came home with a huge, gaping hole in his back where another miner had struck him in the back with a pick axe. Whether this happened by accidental or not, the rest of the Crowleys were never sure. Mayme poured whiskey in the wound and bandaged it. Although it must have hurt like hell, Joe never said a word. Within a short time he healed up. One year, at the Fall Roundup in Faith, Joe rode a couple of bucking broncs. Then, he entered the bulldogging trials. When one steer raced across the arena, Joe dove off his horse to catch the steer’s horns. At the last second, the steer changed directions and Joe landed on his head. He was knocked out cold. A couple of other cowboys pulled him over into the shade, but he didn’t regain consciousness for about an hour. Joe was at a barn dance near Lemmon one night when a fight broke out—not a rare occurrence in those parts. A guy by the name of Sam Irons billed himself as the toughest man in the area at the time, and there was always some young fellow willing to try him in a fight. Joe was standing at the edge of the crowd, watching the fight. Joe’s girlfriend was standing behind him with her arms around him and her head on his shoulder. Suddenly, Sam Irons swung at someone. Sam missed and hit Joe in the head. Joe’s head snapped back and knocked his girlfriend out cold. True to form, Joe then stepped in fought Sam and a couple of the other guys who had been challenging Sam. Afterward, he and his girlfriend went back inside and danced as though nothing had happened. Joe had his share of fist fights at country dances, both before and after the incident with Sam Irons. He had a lot of scars to prove it. Unlike today, fighting was considered sport in those days—at least it was out in the prairie settlements. There always had to be a guy in the area known as the local tough, and fighting was how it was determined. So, Joe was not considered a brawling bad guy or a thug. Joe had his moments in his youth when he could be a real ne’er-do-well, as do many of us. One of the more embarrassing incidents occurred when he was hired by the City of Faith to be their Town Constable at the Fourth of July celebration one year. They gave him a badge, a revolver, and a bunch of shells. Along in the early hours of the morning, Joe got real bored and shot out some of the street lights. That was the end of that job. 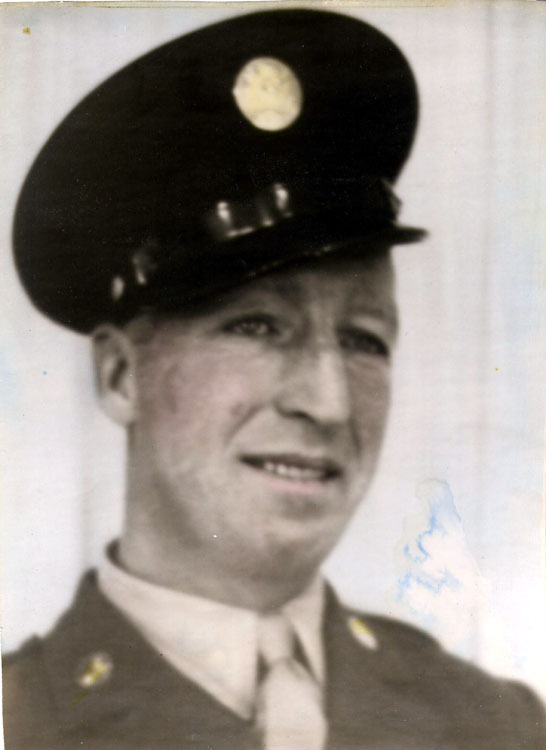 In June 1942, Joe joined the Army and shipped out to Fort Snelling in Minnesota. Joe got into bar room fights every once in awhile while he was in the service, as did a lot of the fellows. Someone got hurt real bad and died after one of those brawls. It left Joe chastened. Later, after the war, Joe moved to Alameda, California, and tended bar at a small place called the Buckhorn for years. He lived a mostly quiet life with his wife, Mary, in a small rented house. Despite his new surroundings, though, Joe looked the wizened old cowboy until the end of his life—tall, lanky, cowboy boots, a western shirt, and a cowboy’s string tie.